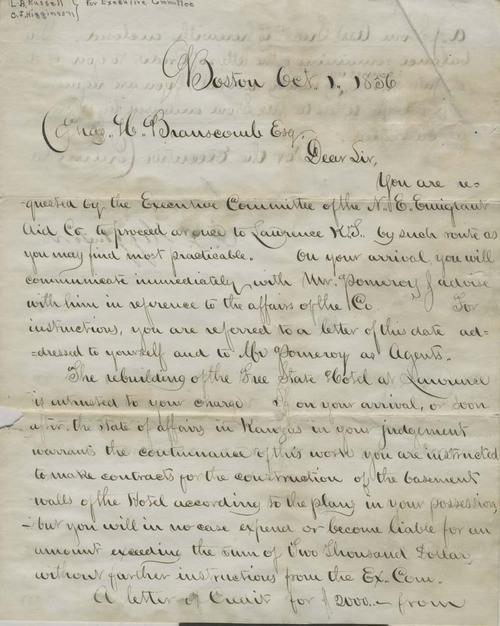 Le Baron Russell and Charles J. Higginson, members of the New England Emigrant Aid Company Executive Committee, wrote from Boston to Charles H. Branscomb in Kansas. Russell and Higginson informed Branscomb, as agents for the company, that he would oversee the rebuilding of the Free State Hotel in Lawrence, Kansas Territory. The hotel had been destroyed during the sack of Lawrence on May 21, 1856. Call Number: New England Emigrant Aid Company, Manuscript Coll. No. 624, Box 1, Folder 8.